Back in 1987 Joe Benshemesh started setting up sites for monitoring Malleefowl mounds in Victoria. Similar programs soon sprung up in SA and WA and grew steadily over the years, supported by volunteers in each state. Now, every year, hundreds of people gather information from more than 3000 mounds. At the 2004 Malleefowl forum in Mildura it was decided that all this information needed to be gathered into the one place...a national database! 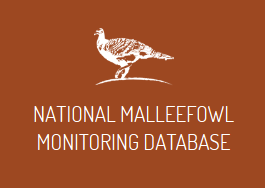 We needed to ensure that all of the data going into the database was collected and recorded in the same way so a set of guidelines were written (the National Malleefowl Monitoring Manual) and are available in the Library section of this website. With the growth of the digital age, we have seen vast improvements with data collection (using Palms and then GPS PDA’s and now smartphones), gathering of digital images of each mound, and the growth of the data base into an incredibly useful tool that also allows volunteers to see the outcome of their combined efforts. All volunteers can get access to the site. Of particular interest is the file of all past photos of the mounds. Each year another photo is added for each mound, resulting in a slide show of the many stages a mound can go through. The database is also an incredibly powerful tool for scientists to use when analysing mound use over the years, although its main function is to track trends in Malleefowl populations. Remember that we use mound activity as the best indicator of species survival; the greater the number of active mounds, the more Malleefowl out there in the bush. The database is still getting a few refinements but is already a fantastic resource just waiting to be taken to the next stage. It’s an amazing credit to all of our volunteers’ efforts over the many years of data collection and makes available some very important pieces of information. That is, how Malleefowl populations are going; where Malleefowl numbers are increasing and where they are decreasing. Knowing what the trends in Malleefowl populations are in different areas is not just an interesting thing to know. It immediately leads us to ask ‘why are Malleefowl doing better here than there?’ Answering this question informs us what the species requires to survive. The annually updated information also allows managers to target certain areas where the birds seem to be struggling, and to measure how effective different management actions are. Contact us if you would like to get involved in monitoring Malleefowl. The aggregated data produced through this database was gathered by many individuals, many of them volunteers, and is held in trust by the National Malleefowl Recovery Group Inc. The information will be used to provide management information to land managers or as directed by the National Malleefowl Recovery Team.